I have a laptop with a Hungarian keyboard, but I usually use a Finnish external keyboard. My problem is that very often windows tries to be smart, and it changes that layout of the keyboard on it's own, when I'm switching between apps, and very often it can be annoying that whenever I start typing I have to switch back the layout to Hungarian or Finnish, depending on if I'm using the build-in keyboard or the external ( I have to do the alt-tab combination). So, is there any way that I disable that windows changes the keyboard layout on it's own? Open control panel(Click Desktop Icon, take your cursor into the left bottom corner, right click, you will also find the control panel option or open Run box + R type control and Ok). Switch to all items view. In the left hand side panel choose advanced settings. Uncheck the box under Switching input method that says Let me set a different input method for each app Windows. Now this is the part that worked for me. Easy way to see which input language is chosen, turn on you language bar. Now whenever you see the wrong characters you can see in the language bar which input language is currently in use. 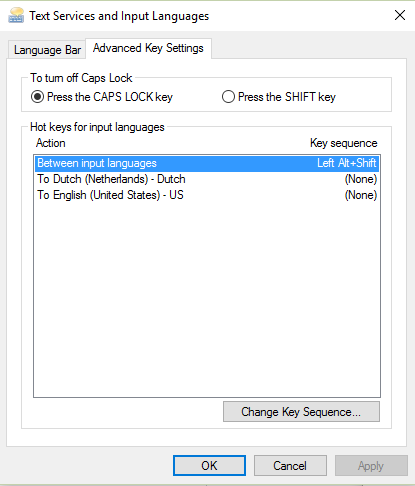 The first part of the first answer is OK: Go to the control panel, go to “Languages,” check your language options. Underneath each language you see a line saying “Input Language or just Input.” Click on “change” or the existing language (dependent on the OS version). A long list of languages appears. I clicked on “U.S. International” and applied it. Now one of my language options says: German, Input language: US English international, which is my default language. That will prevent the switch to different keyboard layouts. My OS is Windows 8.1. In an intuitive OS, you would find this under “Keyboard -> Keyboard Layout” but Microsoft likes to play hide-and-seek a lot more than I do. Not the answer you're looking for? Browse other questions tagged windows-8 keyboard keyboard-shortcuts keyboard-layout or ask your own question. 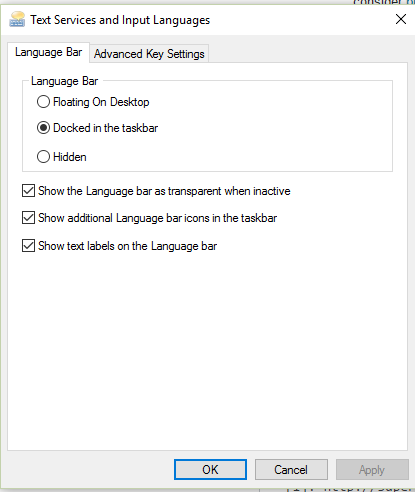 Windows 8.1 automatically change my keyboard settings, why? How can I solve this issue? How do I turn off accent combining in Windows 7?